A number of readers have asked me to comment on the Swiss Gold Referendum and what it may mean for the price of gold. Let's start with a recap of the three primary points that citizens in Switzerland will vote on. Of course, central bankers everywhere are horrified by the idea they should have to do anything, especially hold sound assets. And in a flurry of fearmongering by the central bank and inflationists in every corner, it appears the initiative is headed towards defeat. Polls aside, let's play a bit of "What If?" Specifically, what would happen to the price of gold if the referendum passes? Variant Perception says Swiss Gold Referendum: A Spanner in the Works. As polls continue to swing around ahead of the Swiss gold referendum on 30th November, we expect increased volatility in the FX and gold market. 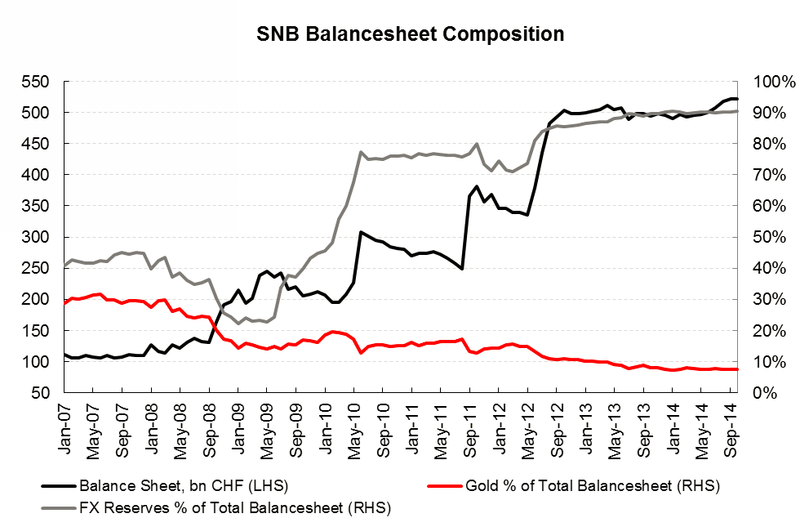 After the implementation of the EURCHF floor, gold’s share of the SNB balance sheet has fallen to 7.5% from around 30% in 2007 (top chart) [SNB Balance Sheet]. The SNB has already pointed out the untenable nature of the peg should the referendum pass, but the impact on the gold market would also be significant. Taking the current balance sheet of 522bn CHF and spot gold prices, the requirement to hold at least 20% of assets in gold would necessitate buying 1,800 tonnes of gold over 5 years. Total global production in 2013 was 2,982 tonnes, thus the SNB would need to buy at least 10% of the annual production every year for the next 5 years. 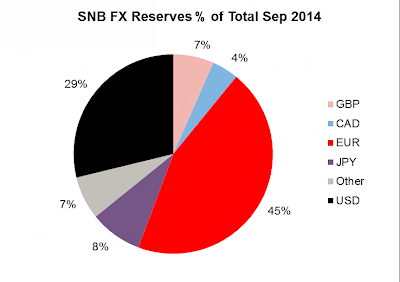 The bottom chart [SNB Reserves] shows the latest composition of the SNB’s FX reserves. 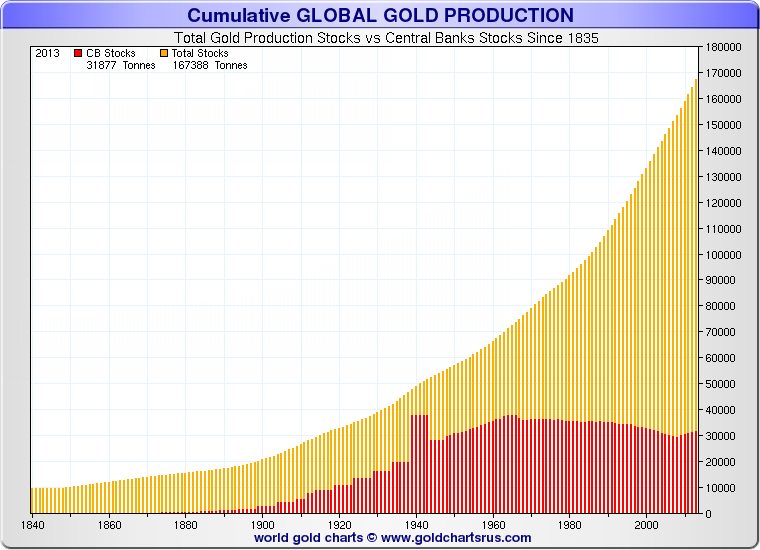 The requirement to buy gold will necessitate selling reserves, mainly EUR (which makes up 45% of all reserves). Should these euro selling flows come to pass, it will weigh heavily on the currency. I am a fan of research by Variant Perception, but I believe they may have missed the boat here. Specifically, I question if gold production is much of a factor at all. That may sound strange since the referendum would require Switzerland to purchase a big percentage of all future gold mining over the course of 5 years. However, mining is not the only supply. Nearly all of the gold ever mined is available for a price. It's reasonable to exclude gold in museums, historic items, rare coins and the like, but in aggregate there may be over 170,000 tons or so of gold supply. 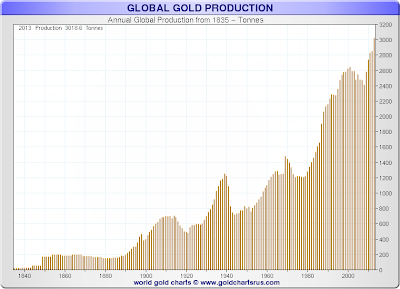 A few charts courtesy of Nico at Sharelynx Gold will explain. That said, one must also factor in gold psychology. 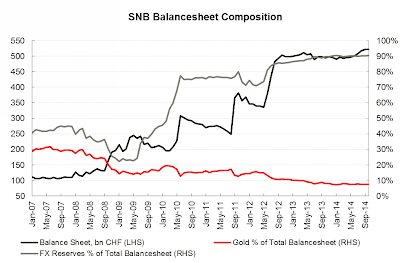 It is entirely possible that SNB purchases could significantly alter perceptions on the desirability of holding gold. From that aspect, Variant Perception may indeed be correct on their assertion of the importance of the referendum should it indeed pass. 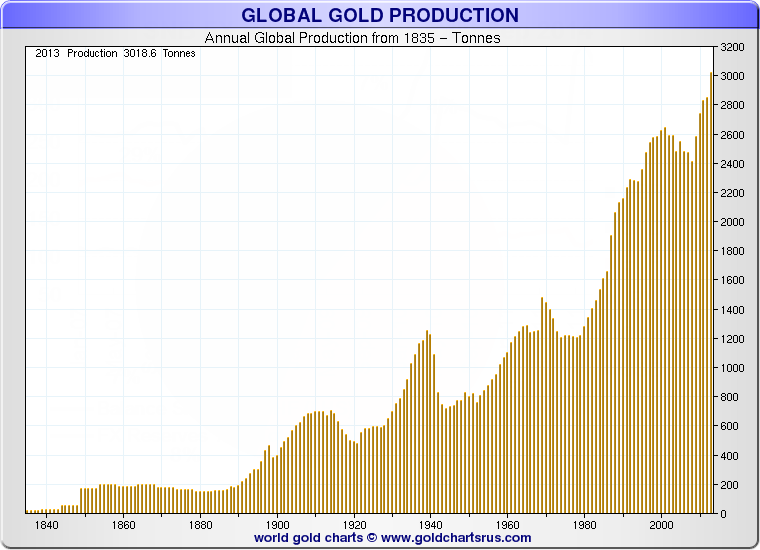 Many gold analysts point out gold production vs. jewelry demand. It's essentially the same miss-analysis. Jewelry demand is of little meaning in and of itself as a factor in price. 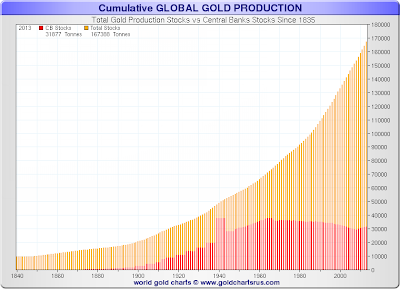 Someone has to hold every ounce of gold ever produced. 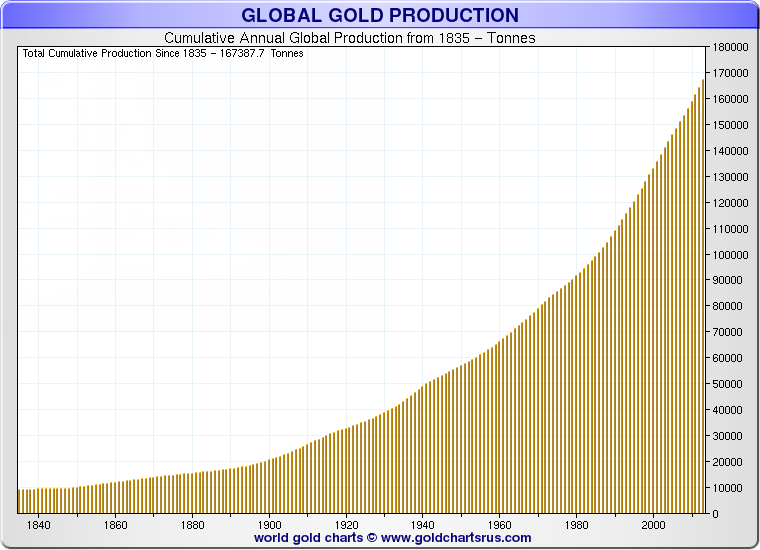 It's that demand for gold, all 170,000 tons of it, that determines the current price, not production. By the way, 170,000 tons of gold would fit into a cube about 67 feet wide, high, and deep. It does not take a lot of space to hold a fortune in gold. I do not know the future price of gold, nor does anyone else. But I do know the fundamental drivers as well as the reasons to hold gold. And neither of those has changed. For further discussion, please see Plague of Gold Bears Now Say "Gold Unsafe at Any Price"; What's the Real Long-Term Driver for Gold?